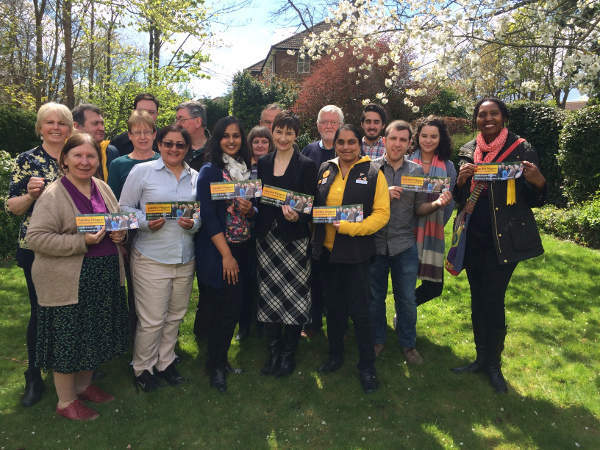 Caroline joined local Lib Dem London Assembly candidate for Sutton and Croydon Amna Ahmed along with her local Lib Dem team for a campaigning session in Sutton. They received a great response on the doorstep and there was a lot of recognition of the hard work of local MP Tom Brake and also the Lib Dem-run Borough Council from local residents. 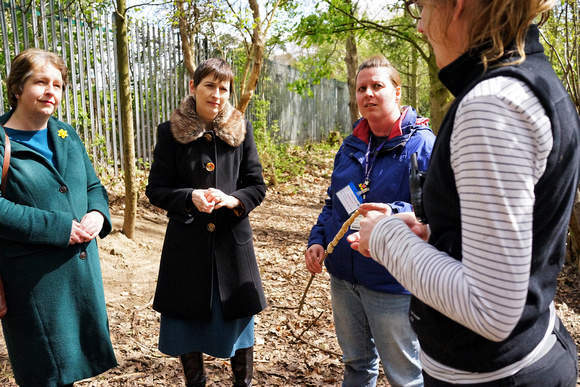 Caroline visited the Wide Horizons Environment Centre with local Lib Dem London Assembly candidate for Greenwich and Lewisham Julia Fletcher. Based in South East London, the Wide Horizons Environment Centre is a unique nine-acre wildlife site specifically designed for educational use offering a wide range of curriculum based day visits for children of all ages. 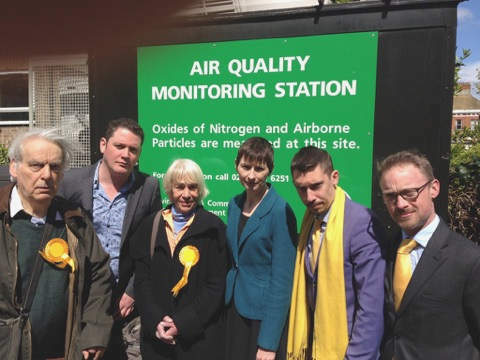 Caroline went to Putney High Street with local Lib Dem London Assembly candidate for Merton and Wandsworth Adrian Hyyrylainen-Trett to campaign for better air quality. Putney High Street was recently named by the Evening Standard this week as the number one worst spot in London for harmful nitrogen oxide readings for 2016 so far. 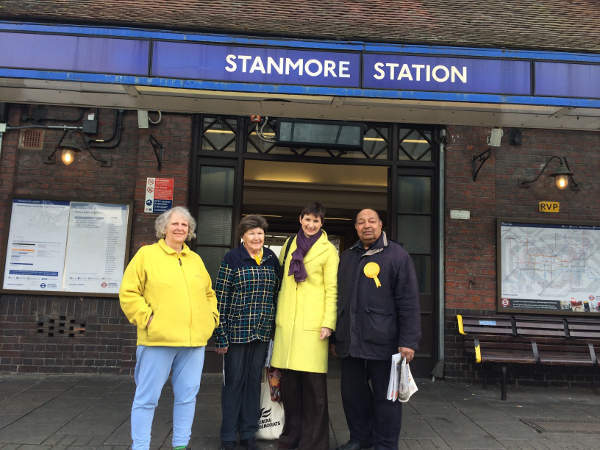 Caroline joined local Liberal Democrat members in Stanmore, Harrow for a campaigning session. She discussed the upcoming Mayoral and London Assembly elections, especially her transport policy ideas, with many local residents and received positive feedback. 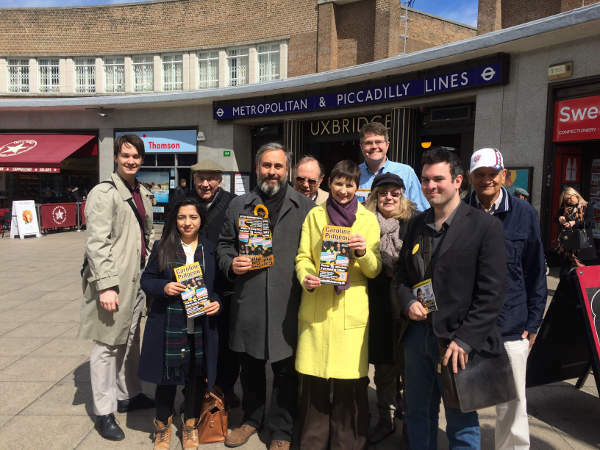 Caroline joined local Liberal Democrat London Assembly candidate for Ealing and Hillingdon, Francesco Fruzza, out campaigning in Uxbridge and Hillingdon, along with the local Lib Dem team. 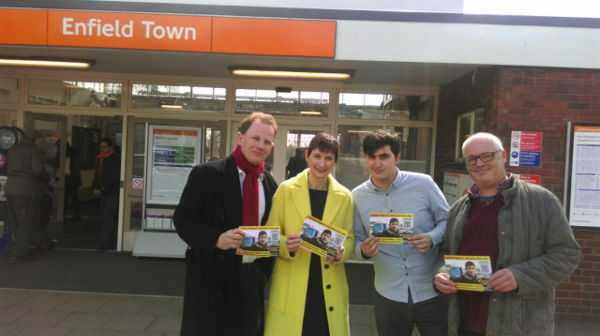 They talked to local shoppers about Caroline’s Half Price Fares Before Half Past Seven policy and improving childcare to make it work for more families across London. They had a great response from local people. Caroline joined her Liberal Democrat London Assembly candidate colleagues Rosina Robson and Merlene Emerson to campaign in Teddington in Richmond. They were joined by local Liberal Democrat Richmond councillors and campaigners, including Baroness Sheehan and veteran Lib Dem campaigner Chris Maines. 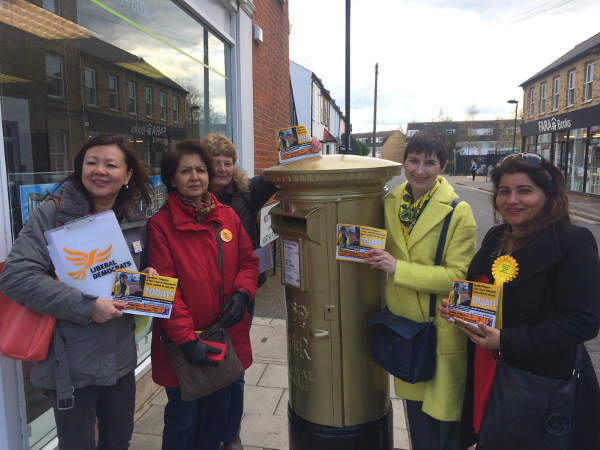 The team received a fantastic response on the doorstep and then went to see Mo Farah’s gold post box from the London 2012 Games. 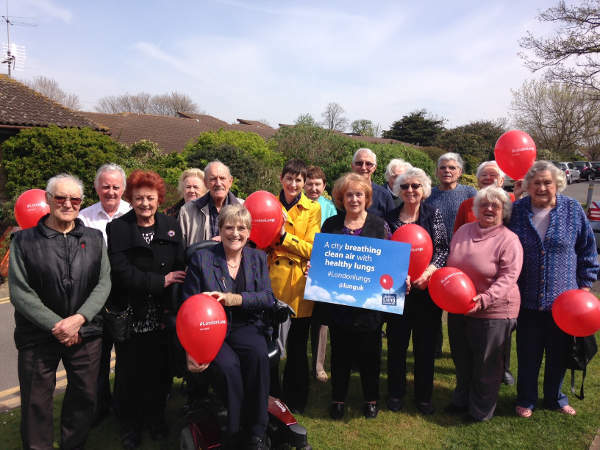 Caroline went to Sutton with Lib Dem member of the House of Lords Baroness Brinton to visit the Sutton Breathe Easy patient support group, which is a group that offers help and support to people with lung conditions. This group is part of the British Lung Foundation network, an excellent charity that campaigns tirelessly to improve air quality in the UK. 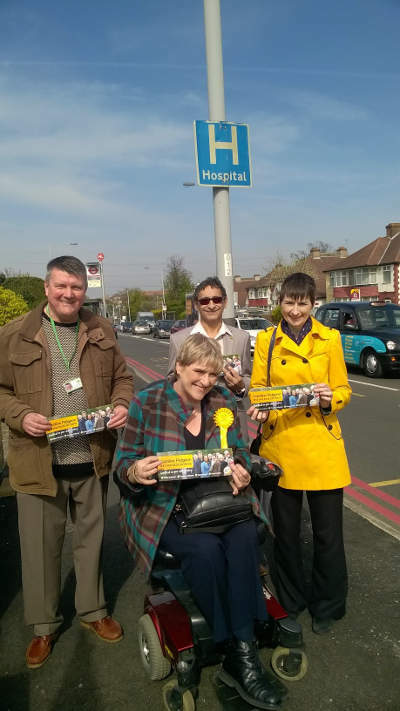 Caroline went out campaigning with Baroness Brinton in Sutton. 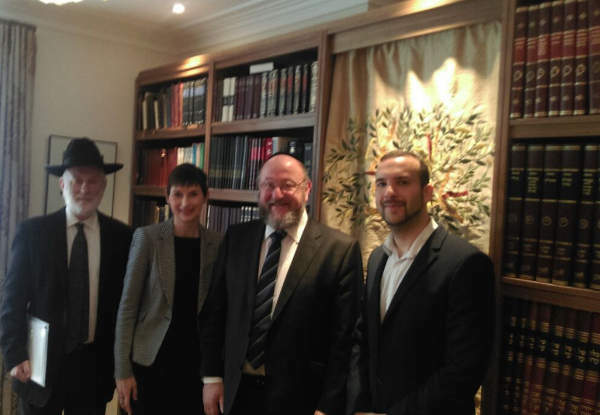 They met with local Liberal Democrat councillors Paul Wingfield and Arthur Hookway, who both represent Worcester Park ward, and spoke to many local residents about the upcoming Mayoral and London Assembly elections. They had a great response on the doorstep, especially to Caroline’s plans to increase police numbers in London by 3000. Caroline went out campaigning in Enfield with the Lib Dem team, including local resident and Lib Dem campaigner Paul Smith. They talked to many local residents about the popular Half Price Fares before Half Past 7 campaign, along with other issues and received a warm reception on the doorstep.